Pancreatic cancer is the fourth-leading cause of cancer death and is relatively resistant to chemotherapy and/or radiation, with the only real cure being surgery. However, only 20 percent of patients qualify for surgery and, of those, only 20 percent will be alive in five years. Meanwhile, the surgery itself carries a 1-3 percent risk of death and a 40 percent risk of a major complication. It’s estimated that 20 to 30 percent of pancreatic cancers originate from mucinous type pancreatic cysts, which are found in 2 percent of Americans and become increasingly prevalent with age. The prevalence of pancreatic cysts increases to 37 percent in people aged 80 and older. Most of these fluid-filled tumors are precancerous. The more common smaller cysts typically follow a non-aggressive natural history; however, some mucinous pancreatic cysts—ones that are > 1.5 cm, enlarging or have developed other high-risk features—are more likely to become cancerous. Most pancreatic cysts can be managed with surveillance, which generally means keeping an eye on them with annual magnetic resonance imaging or computed tomography (CT). But this is costly and may take a psychological toll on patients who are living in fear of cancer. Additionally, with CT imaging, patients are also exposed to radiation and possible nephrotoxicity. Matthew T. Moyer, MD, MS, associate professor of medicine, Penn State Health Milton S. Hershey Medical Center, Division of Gastroenterology and Hepatology, and Penn State Cancer Institute, is the principal investigator of an upcoming phase 3, multi-center, randomized, prospective clinical trial that will test a new approach to destroying mucinous pancreatic cysts before they can progress to cancer. The technique builds on endoscopic ultrasound (EUS), a procedure that’s commonly used to diagnose and evaluate pancreatic cysts. In this procedure, an endoscopic ultrasound is sent from the mouth into the stomach and duodenum, from where it can image the pancreas. A needle can aspirate fluid from the cyst, which is used to characterize it. Figure 1. The endoscopic ultrasound-guided (EUS), fine-needle aspiration cyst ablation process: The needle is introduced into the center of the cystic lesion. Following near-complete aspiration of mucinous fluid from all compartments, the cyst is then repeatedly filled and aspirated with the lavage solution. This is followed by subsequent filling with the chemoablation agent(s) using the same volume as was originally aspirated. Researchers at Massachusetts General Hospital in Boston were the first to discover that by lavaging, or flushing, the cysts with alcohol after removing their fluid, approximately 30 percent of the tumors were ablated or destroyed. After this development, researchers in South Korea advanced the technique. Following the alcohol lavage, they infused the cyst with paclitaxel, a chemotherapy agent, which increased the ablation rate to between 50 and 70 percent. “Now you’re talking about something that actually works,” Dr. Moyer says. But there was a problem: in all cyst ablation trials to date, the alcohol lavage had an inflammatory and toxic effect that can affect adjacent tissue, resulting in a 3 to 10 percent serious adverse event rate. 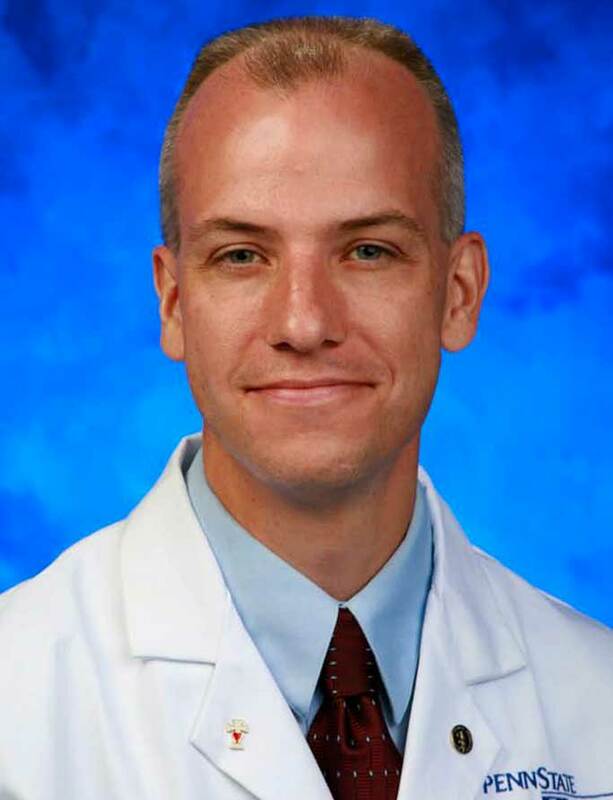 In the Chemotherapy for Ablation and Resolution of Mucinous Pancreatic Cysts (CHARM I) trial, which ended in late 2016, Dr. Moyer led a team of investigators from interventional endoscopy, surgical oncology, hematology oncology, and investigational pharmacology at the Milton S. Hershey Medical Center who tested an alcohol-free approach to endoscopic ultrasound-guided mucinous pancreatic cyst ablation. Figure 2: A) MRI-MRCP imaging of an 83-year-old male with a blue arrow point to a 2.7-centimeter intraductal mucinous pancreatic neoplasm prior to EUS-guided chemoablation. B) Follow-up MRI-MCRP imaging reveals no evidence of a residual cyst at the six-month follow-up evaluation. The prospective, randomized, double-blind study involved 46 participants. Patients were randomized to receive either alcohol or saline lavage, followed by infusion of a chemotherapy cocktail developed by Dr. Moyer that combines the chemotherapeutic agents paclitaxel and gemcitabine. At 12 months, 67 percent of patients who underwent alcohol-free EUS-guided cyst chemoablation had complete ablation compared with 61 percent of patients in the alcohol lavage group. Serious adverse events occurred in 6 percent of patients in the alcohol group versus none in the alcohol-free group. Minor adverse events occurred in 22 percent of patients in the alcohol group and none of the patients in the alcohol-free group. This showed that alcohol is not required for effective cyst ablation, and that when alcohol is removed from the process, there is a dramatic reduction in associated adverse events. “Now we’re talking about a procedure that’s incredibly safe,” Dr. Moyer says. Next, Dr. Moyer will lead investigators at Penn State, Dartmouth College and the University of Indiana in the multicenter CHARM II trial, which will receive $2.7 million in funding over five years from the National Institutes of Health. In addition to verifying the previous findings in more patients at multiple sites, the trial will also test a few additional refinements, including a larger dose of the chemotherapeutic cocktail and two ablations instead of one. The CHARM II trial will include 100 participants and will begin recruitment on Jan. 1, 2019. Fellowship: Gastroenterology, Penn State Health Milton S. Hershey Medical Center, Hershey, Pa.
Residency: Internal Medicine, Penn State Health Milton S. Hershey Medical Center, Hershey, Pa.